At this point, our forecast for Thursday's coastal storm (nor'easter) is pretty much locked in. A wintry mix of snow, sleet, freezing rain, and plain rain will affect most of New Jersey for most of the day. Thursday's winter storm forecast, as of Wednesday evening. 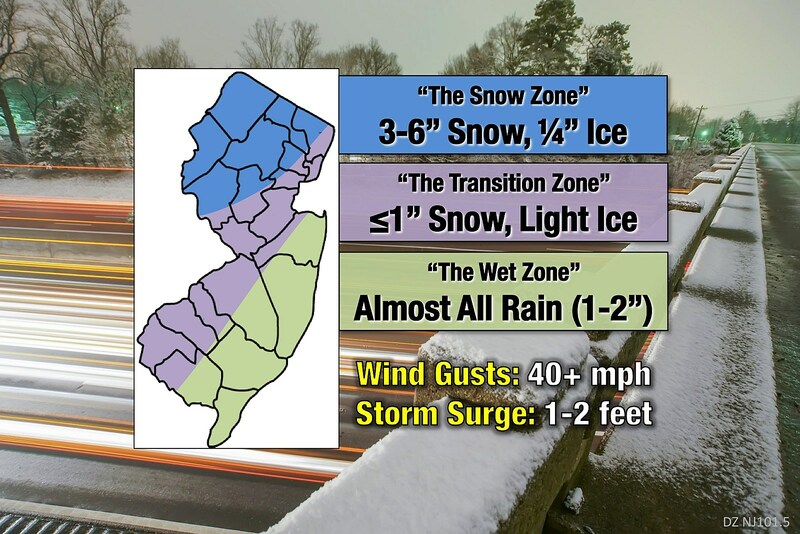 The biggest snow/ice accumulations will certainly be found in northwestern New Jersey, where colder temperatures will keep the precipitation as snow and/or sleet for almost the entire duration of the storm. I'm pretty pleased with the placement and magnitude of my 3 to 6 inch contour. In South Jersey and along the Jersey Shore, it's going to be a wet day. Not wintry. In the middle, from New York City to Philadelphia (and everywhere in between), you'll see a messy transition from snow/sleet to freezing rain to rain. It's all about temperatures — the colder it stays, the more snow will potentially accumulate. Since my early morning forecast, the storm has trended slightly slowly (meaning a later start time) and the forecast looks less snowy and icy for the I-295 corridor and Monmouth/Middlesex counties in particular. I've decided to simplify my forecast map into three "zones" — where mostly snow and ice will fall, where the most significant transition will occur, and where rain will be the predominant precipitation type. The peak of the storm, including the highest risk for slippery conditions, will be Thursday midday through evening — lunch to dinner time. 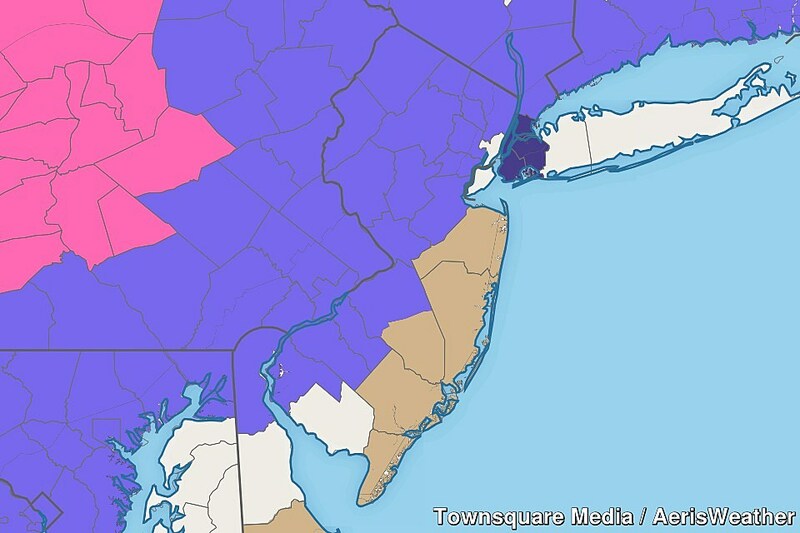 North Jersey, you may have to be patient — snowflakes may not begin to fall until mid-afternoon. I know we're focused a lot on the snow and ice, but don't ignore the heavy rain potential. 1 to 2 inches of rain will fall, and heavier downpours may cause reduced visibility and flash flooding. Regardless of what's falling from the sky, your evening commute looks very sloppy. An additional concern: 40+ mph winds, especially close to the coast. That combined with the icing threat could lead to extended power outages. Those effective times should give you a pretty good estimate of when the "wintry" weather is forecast to arrive and then transition to all/mostly rain. I believe those expiration times are a bit on the early side — the latest model guidance shows ferocious winds continuing (and possibly peaking) through the overnight hours. Even though this is not going to be a "major" winter storm, travel conditions will become pretty poor for most of the state for much of Thursday. (Especially during the evening rush hour.) Please take the risk seriously. Carefully consider your plans for Thursday afternoon and evening and take all necessary precautions to ensure your safety. I'll have one more weather blog post about this coastal storm early Thursday morning (by 7 a.m.) Our news, traffic, digital, and programming teams are at-the-ready to keep you updated on power outages, flooding, road closures, accidents, etc. The best way to stay informed is via our free mobile app, which we can use to send instant alerts of critical information.